“Executives from some of the biggest U.S. financial firms said a slump in trading that has hammered bank results for more than a year is likely to continue to weigh on profits. Large investors are retreating from the market, big trades are rare and price swings are shrinking, executives told investors at an industry conference in New York on Tuesday. Those factors have combined to reduce trading revenue, particularly in fixed-income, currencies and commodities trading, traditionally a profit engine for large banks. His words echoed the comments of J.P. Morgan Chase JPM +1.12% & Co.’s head of investment banking, Daniel Pinto, who said volatility levels were at 10- to 15-year lows. He said that even if trading volumes rise, it is hard to make money if volatility is low. “If the market doesn’t move, it’s really difficult,” he said. The comments follow several quarters of disappointing results in trading. Aside from Citigroup and J.P. Morgan, Goldman Sachs Group Inc. GS +1.01% and Bank of AmericaCorp. BAC +0.72% also have struggled as trading slowed. Some investors have begun to worry that the slowdown may be more than a temporary phenomenon. Some have expressed concern that the decline could be more permanent as regulators limit banks’ own trading and risk-taking in general. “Until you see volatility increase, trading revenues in general will be challenged,” said Barclays analyst Jason Goldberg. He said the second quarter is shaping up to be tough in part because commodities-trading revenue likely won’t be as high as in the first quarter. J.P. Morgan’s Mr. Pinto said he believed the decline likely would be temporary, or cyclical, rather than part of a long-term trend. “Hewlett-Packard Co. HPQ -2.28% is cutting thousands more jobs, as efforts to revitalize the company have sputtered amid a rapidly changing technology landscape. The Silicon Valley giant said Thursday it would cut an additional 11,000 to 16,000 jobs on top of 34,000 positions it previously said would be eliminated as part of a multiyear restructuring plan. At the midpoint of that range, the new cuts would trim an additional 4% from H-P’s workforce of about 317,500 employees. News of the job cuts came as H-P announced results for its fiscal second quarter, revealing a drop in revenue that overshadowed higher profit. The results follow two quarters that had generally pleased investors, as the company appeared to stabilize itself under Chief ExecutiveMeg Whitman after several years of turmoil. 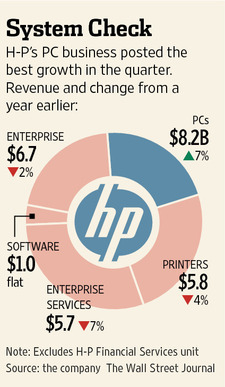 H-P, known largely for personal computers, server systems and printers, has been grappling with stiff competition and big shifts in the technology industry. Challenges across its array of businesses, along with the new job cuts, may complicate efforts to revive growth and innovation. Ms. Whitman sought to portray the unexpected job cuts as an opportunity to further streamline a company that had grown bloated over the years through multiple acquisitions. “I’m not at all disappointed, I think it’s the natural course of what makes sense in a turnaround of this size and scale,” she said. The restructuring, along with continued investments in growth areas such as cloud computing, analytics software and networking technology, would set up the beleaguered Silicon Valley icon “as a force to be reckoned with,” she said. But some analysts wondered if Ms. Whitman was trying to get ahead of potentially weakening demand by announcing the new job cuts. Alibaba Files For IPO, Is the Valuation Reasonable or the Epitome of a Bubble ? Wed May 7, 2014 8:40am EST Comments Off on Alibaba Files For IPO, Is the Valuation Reasonable or the Epitome of a Bubble ? “(Reuters) – Alibaba gave investors a closer look at the scale and growth of the Chinese e-commerce juggernaut in an initial public offering (IPO) prospectus filed on Tuesday, the first step in what could be the largest technology debut in history. Alibaba Group Holding Ltd, which powers 80 percent of all online commerce in the world’s second-largest economy, is expected to raise more than $15 billion, and could top the $16 billion pulled in by Facebook Inc when it listed in 2012. The bulk of the proceeds will go to Yahoo Inc – which bought a 40 percent stake in Alibaba in 2005 for $1 billion and which must sell more than a third of its current 22.6 percent stake through the IPO. Alibaba also plans to sell new shares, people familiar with the plans have said, to bulk up a cash war chest depleted by a rash of recent acquisitions. While the Alibaba brand is less well known in the United States than Internet companies such as Amazon.com and Facebook, the Chinese company’s listing has stirred the most excitement in Silicon Valley and Wall Street since Facebook’s record IPO. Alibaba will become the largest Chinese corporation to list in the U.S. – on either the New York Stock Exchange or the Nasdaq. Alibaba will debut later this year in a market where high-flying tech stocks like Twitter and Amazon have fallen in recent weeks in a sell-off that has divided analysts and investors, reviving doubts about soaring tech valuations. Still, estimates of Alibaba’s market value have soared in recent months, to even beyond $200 billion, underscoring Wall Street’s eagerness to take a crack at a massive Chinese company with robust growth. “Global machinery giant Caterpillar earned $1.61 per share on an adjusted basis, which was much stronger than the $1.23 expected by analysts. Management also raised earnings guidance. It now expects to earn $6.10 per share for the year, up from previous guidance of $5.85. The stock is up 3.5% in pre-market trading. Caterpillar sells mining and construction equipment around the world, making it one of the better bellwethers of the global economy. “Citigroup Inc. is warning investors it may miss a key profitability target after the Federal Reserve rejected the bank’s capital plan last month, people familiar with the matter say. The Fed on March 26 shot down the New York bank’s proposal to boost its dividend and ramp up stock buybacks, saying it had failed to measure potential risks to its operations during a severe economic recession. Corporations Find Themselves Flush With Cash, Will They Spend It or Hoard It ? Wed Jan 22, 2014 7:20am EST Comments Off on Corporations Find Themselves Flush With Cash, Will They Spend It or Hoard It ? “When the corporate cash dam bursts, everything will be ok, right? Well, maybe. Investors betting that the past year of more than 20 percent gains in western stock markets can be echoed, or at least sustained, through 2014 have long assumed that a corporate spending revival will nurture a building economic recovery. The argument is simple. Years of banking crises, credit droughts and economic uncertainty have prevented businesses investing for the future. Instead, they have clipped costs, wages and jobs and built up huge stockpiles of cash rather than investing in new plants, staff, updated technology, equipment or acquisitions. As the economic fog lifts, this idle, near zero-yielding cash will surely be put back to work eventually, they argue, creating a potentially virtuous circle of greater demand, higher growth, earnings and employment all round. The problem, however, is that assumes cash stockpiling has all been due simply to a hiatus in the economic cycle. Many argue the hoarding is instead driven by more durable demographic trends and political reforms that are stirring corporate anxiety about exposure to soaring pension and healthcare costs as workforces age and government coffers shrink. “Trading in NuSkin stock has been halted after cratering 21.6% during today’s trading day. Earlier this week, the multi-level marketing firm was the subject of a negative article in The People’s Daily” in China. The article claimed that the company lies to its distributors, was sold without proper regulatory approvals, and made inaccurate scientific claims. Is it Time to Dump Banks Stocks Like Some Billionaires Have Been Doing? Tue Jan 7, 2014 8:06am EST Comments Off on Is it Time to Dump Banks Stocks Like Some Billionaires Have Been Doing? The trading boom that helped reshape global investment banks over the past decade is sputtering, raising fears that one of Wall Street’s biggest profit engines is in peril. Executives have warned that lackluster markets could lead to year-over-year declines in fixed-income, commodities and currency trading revenue when banks begin reporting fourth-quarter results next week. That would mark the fourth consecutive drop and the 11th in the past 16 quarters. 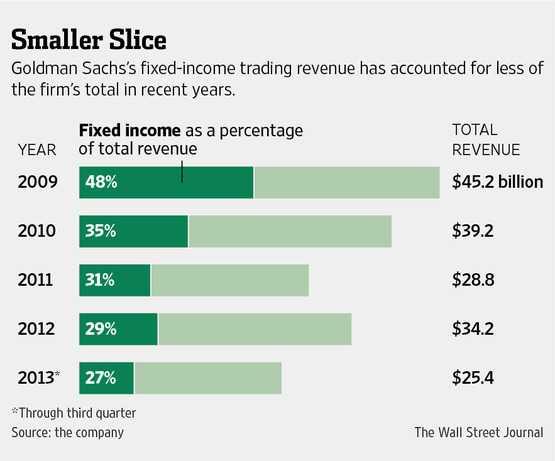 Few corners of banks’ trading operations have escaped the slump. A 10-year commodities rally has fizzled, while foreign-exchange trading volume has fallen sharply from its 2008 peak. Since the financial crisis, investors have eschewed exotic fixed-income securities in favor of low-risk government bonds, which are less profitable for banks, and overall trading volumes have dipped. A rash of new regulations, meanwhile, have prompted Wall Street firms to exit from once-lucrative businesses such as energy trading and storing and transporting physical commodities. The slump has gone on so long that some observers are beginning to question whether it is part of an ordinary down cycle or a more permanent shift. Mr. Kotowski cited the big transformations that have rocked global markets in the past few years, such as new technologies. Those advances have helped level the playing field by allowing institutions to make some trades on their own, reducing the amount banks bring in for matching up orders. “The latest rebalancing of the Nasdaq 100 index NDX will see Tesla Motors TSLA join the index to replace Oracle ORCL , which is moving to the New York Stock Exchange and will no longer be eligible for inclusion. The move is a testament to Tesla’s rapidly advancing shares, and another feather in the cap of CEO Elon Musk. But it may also signal a slowdown for the stock, judging by what happens when stocks join the Nasdaq 100. Ryan Detrick of Schaeffer’s Investment Research found that stocks added to the Nasdaq 100 over the years have tended to underperform those that are removed. “When you are added it means things are going great. Now things can continue to go great, but it does set up a higher bar,” Detrick said in e-mailed comments. The stocks removed from the Nasdaq 100 going back to 1995 have averaged a return of 22% in the year following their removal, while those added to the index have only averaged a return of 11.6% over the subsequent year. “Whole Foods is recalling Crave Brothers Les Freres cheese in response to an outbreak of a bacterial infection that has sickened people in several states and killed at least one person.